You’ve heard of the angel named Gabriel. But you probably haven’t heard of Gabriel, the rooster. 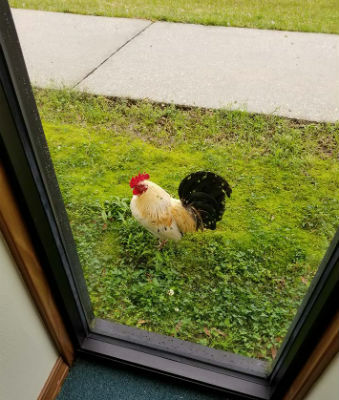 Since November, the fine feathered friend of Pleasant Ridge Church of God has become quite the phenom across the small city of Hammond, Louisiana. Like a guardian angel, “Gabe” stands watch Sunday after Sunday at the front entrance to the church, seemingly crowing Amens at just the right moment during Pastor Sarah Morgan’s sermons. Adored by adults and children alike, the rooster has not only captured the hearts of the congregation, but also the attention of neighbors and passersby. It was Sunday, November 12, 2017. Less than a week had passed since the tragic Texas church shooting one state over had claimed the lives of twenty-six. Sorrow, mixed with shock, still lingered across the country, and some were flocking to church that Sunday for a word of hope. When Sarah Morgan arrived at Pleasant Ridge that morning, her eyes locked on a strange sight before her: a rooster, standing at the door. There were no other roosters or hens in the area. Knowing roosters can sometimes be aggressive, Pastor Sarah approached with caution. The rooster didn’t attack. And he didn’t go away. Of course, he probably felt welcome to stay once they started feeding him. That could have posed a problem, but instead became a beautiful blessing. He quickly became a symbol of joy during an otherwise difficult time. The congregation began expecting him to be there each Sunday, delighted to see a familiar…beak. Once everyone was inside for worship, Gabriel wouldn’t leave the premises. In fact, he’d pace back and forth, often gawking inside as if to check in on everyone. Sometimes he can be a distraction, but Pastor Sarah says they all take it in stride. After all, Gabe’s become a part of the family. 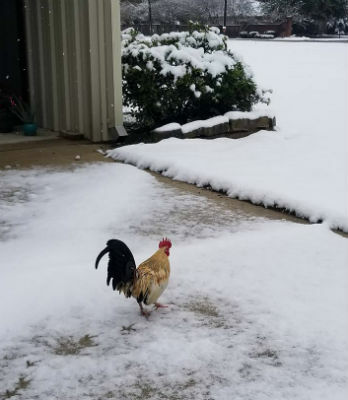 A rare, Louisiana snowstorm didn’t deter Gabriel! Pastor Sarah preaching at Pleasant Ridge. 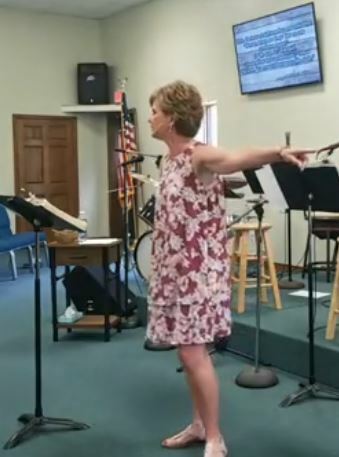 Pastor Sarah Morgan has shepherded the flock at Pleasant Ridge Church of God for five years. When she arrived, attendance hovered between 40 and 50. God has been on the move in the ministry there, bringing children and new families to the church. Attendance often hits 80 now, and sometimes 90. With the “Awaken” theme, reinforced by the presence of a crowing rooster, the church has taken to the streets with prayer, giving life to the community, all while congregational involvement is stronger than ever. In Louisiana, across North America, and around the world, God is on the move in the Church of God. Join the movement. Give life. Donate today at give.jesusisthesubject.org. This entry was posted in All Church of God, Southeast and tagged animals, awakening, chicken, church growth, current events, Hammond, harvest, humor, joy, LA, laughter, Louisiana, mascot, Pleasant Ridge Church of God, revival, rooster, Sarah Morgan. Bookmark the permalink.